Founded by the English mystic Mother Ann Lee, the Shakers- who called themselves “The United Society of Believers in Christ’s Second Appearing”- were know for their ecstatic worship as well as for their industrious devotion to creating heaven-on-earth. Their bustling communities emphasized cooperative living apart form “The World.” During the early to mid-nineteenth century, hundreds of people sought spiritual and economic refuge within the secure boundaries of neatly ordered and carefully controlled Shaker villages. 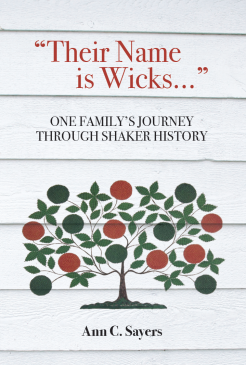 The Wicks family drama documents much about Shaker life, as well as the social and economic conditions which prevailed in the United States in the mid-1800s. Sadly, by the mid twentieth century, most Shaker communities had closed; however today a small number of Believers carry on the faith at the United Society in Sabbathday Lake, Maine. Ann Caroline Sayers was born in London, England, to a Quaker father and a Danish mother. She has been a docent at the Shaker Heritage Society near Albany, New York, for twenty years, and has written and lectured about the Shakers in various venues over the last decade.